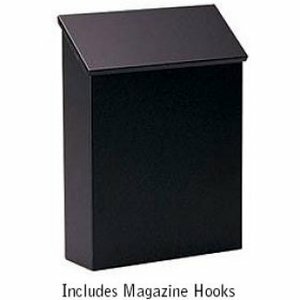 Made of electro-galvanized steel It's designed to be surface mounted and features a durable powder coated finish available in five (5) contemporary colors and includes 5" detachable magazine hooks (not shown) . Traditional mailboxes may be used for U.S.P.S. residential door mail delivery. This box does NOT lock. It is however, available with factory installed stainless steel locking security kit with two (2) keys. The slot size is reduced to 9" by 1"